Hyper Inverter Technology - IAPL GROUP PVT. LTD. The new MHI HYPER INVERTER AIRCONDITIONER uses the TECHNOLOGY NEXT- DC PAM INVERTER + VECTOR CONTROL, with very high efficiency delivering 5.90 COP in SRK18YL-S Series (1.5 Ton Hyper Inverter), which is 33% higher than 5 star rated Conventional AC. Hyper Inverter uses EMBEDED MICRO PROCESSOR- MICRO CHIP having 1 lac + permutation & combination of opening & closing of the EEV (motorized electronic expansion valve) corresponding to the speed of the DC variable speed inverter compressor in accordance to the indoor temperature requirement with respect to the ambient temperature. This microprocessor electronically regulates the flow of refrigerant thru EEV to give optimum refrigeration cycle to deliver highest cooling efficiency at minimum electricity utilization there by giving 65% power saving over Conventional AC. Hyper Inverter gives a wide range of capacity deliverance 0.07 ton to 1.6 ton in SRK18YL-S. Hyper Inverter compressor runs at 130% of its speed to deliver output of 1.6 ton in the initial 15 minutes achieving the desired temperature and once the set temperature is reached it regulates the speed of the compressor at 7% of its actual speed to deliver 0.07 ton capacity to Conventional AC. 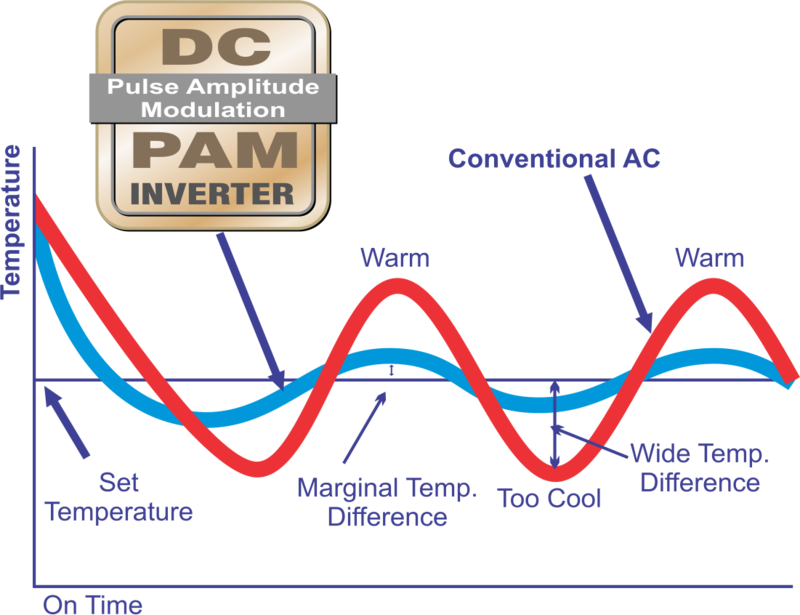 Hyper Inverter uses a combination of PAM (PULSE AMPLITUDE MODULATION) + VECTOR CONTROL for smooth transition between low to high speed and vice versa. New Inverter Control has applied new advanced technology of Vector control and has realized high efficiency. Smooth operation from low speed to high speed. Energy efficiency is further improved in low speed range. Smooth Sine Voltage Wave form are attained.